Ambassador David Friedman releases special holiday greeting ahead of Passover, praises Trump over planned embassy move to Jerusalem. 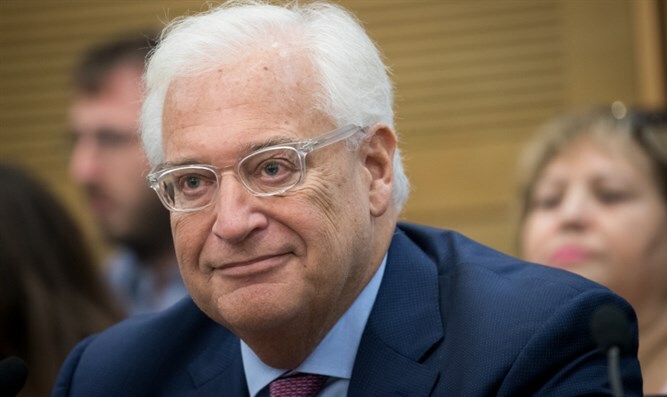 The United States Ambassador to Israel, David Friedman, released a special video message ahead of the Passover holiday which begins Friday evening, wishing Israelis a happy holiday and celebrating the upcoming transfer of the US embassy to Jerusalem. "The holiday of Passover represents the festival of freedom for the Jewish people, who left slavery in Egypt and came to freedom here in Israel,” said Friedman. "To be here in Israel for Passover is a very special moment for me. Every Pesach, at the end of the Haggadah we say 'Le'Shana Habah B'Yirushalayim' - Next Year, in Jerusalem. This year, because of the great efforts of our administration, particularly our president, when we say 'Le'Shana Habah B'Yirushalayim', it has a special meaning." The United States is expected to officially transfer its embassy from Tel Aviv to the Arnona neighborhood in Jerusalem in May, coinciding with the 70th anniversary of the establishment of the State of Israel. The transfer will include the relocation of the Ambassador’s office and some staff to a facility in Jerusalem which currently serves as part of the US consulate. The compound will be expanded over the next year and a half, and the remaining services transferred from Tel Aviv by the end of 2019. President Trump suggested that he may travel to Israel to attend the opening ceremony for the new embassy?